The architects and stonemasons who built Oxford’s dreaming spires also wove their magic in the surrounding villages, where they created grand manors and country houses for the local gentry. Last week saw the launch onto the market of the incomparable, Grade II*-listed Garsington Manor, which sits high on a hill on the southern edge of Garsington village, looking south-west across the Thame valley to the Chilterns. For sale through Carter Jonas (01865 511444) at a guide price of £6.5 million, this historic Jacobean manor house, set in more than 11 acres of glorious formal gardens and little altered since the 17th century, has been described by the architectural historian Jeremy Musson (Country Life, June 26, 1997) as ‘one of the most charming smaller manor houses in England’. There’s no surviving paperwork relating to the manor’s construction, but it probably dates from the 1630s, when it was built by William Wickham on the site of a medieval house owned by Geoffrey Chaucer’s son, Thomas. 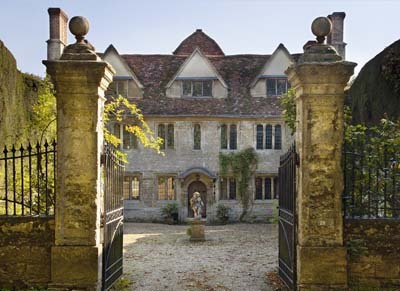 With its mullioned and arched-light windows, the solid, square, 17th-century manor has often been thought of as older, probably because many Oxford builders continued to use 16th-century windows in gentry-houses of the early 17th century. At Garsington Manor, the north front, flanked by tall yew hedges, has the air of a small Oxford college building, and Mr Musson concludes that one of the master masons working on Oxford colleges at around that time may well have been involved in its construction. Two possible candidates spring to mind: master mason Richard Maude, who used similar fenestration at St John’s College and University College, Oxford, or William Arnold, the mason at Wadham College, who was also noted for his use of symmetrical fenestration, a major feature of Garsington’s design. marriage to the Tyrwhitt-Drake family, and became a tenant farmhouse, surviving unaltered into the 20th century, since when a succession of illustrious owners has gone to great lengths to preserve its old-world charm. The interior of the house, however, has been altered to a limited extent over the years. Today, the front door opens into one large hall, with the original hall to the east, and to the west, the dining room that was the original kitchen. Two good-sized parlours-today, the drawing room and the library-both have 17th-century panelling, and although the drawing-room chimneypiece is clearly 18th century, the library chimney-piece is original, although the panelling around it has been altered at some point. Similarly, two of the main bedrooms have 18th-century panelling and others have kept their 17th-century chimneypieces. The modern manor has five reception rooms, a kitchen/breakfast room, 12 bedrooms and 4/5 bathrooms. addition of any size made to the house was the eastern loggia, begun late in 1925, and modelled on the entrance of Cranborne Manor in Dorset. For Jeremy Musson, Lady Ottoline’s most lasting contribution to the house was its setting-the wonderful Italianate garden inspired partly by the gardens at the Villa Capponi, near Florence (Country Life, March 18, 1982). In 1928, the Morrells sold the house and part of the estate to Dr Heaton of Christ Church, Oxford, who added the single-storey kitchen and service rooms to the west of the house. Garsington was later owned by Sir John Wheeler-Bennett of St Anthony’s College, Oxford, who sold it in 1982 to banker Leonard Ingrams and his wife, Rosalind. In 1989, the Ingramses founded the Garsington summer opera festival, which continued to flourish despite Mr Ingrams’ sudden death in 2005, but has now transferred to Mark Getty’s Wormsley estate. The couple’s daughter, Catherine, has vivid memories of growing up at Garsington Manor, and then as ‘an embarrassed teenager’ retreating to the huge top-floor attic to watch the opera in the courtyard below, ‘seeing, but unseen’ by its enthusiastic audience. She and a friend are now planning Garsington’s musical swansong-a series of three concerts of chamber music, with Lieder sung by the tenor Mark Padmore, which is due to take place in July. Another 17th-century Oxfordshire gem is gloriously unspoilt The Old Rectory at Islip, seven miles north-east of Oxford, the birthplace of Edward the Confessor. Islip’s only Grade II*-listed building, The Old Rectory, is currently for sale through Knight Frank (01865 790077) at a guide price of £3m. The classic William and Mary house was built in 1690 by Robert South, an eminent theologian, who was rector from 1678 to 1716. An early engraving shows the original entrance to the house as being on the south side, overlooking a splendid walled garden, with steps leading up to the main door. The enormous stone tithe barn was built at the same time. One of the rectory’s most notable incumbents was the eccentric William Buckland, a leading geologist, who was made Dean of Westminster and Rector of Islip in 1845. His ambition was to eat his way through the animal kingdom, and bizarre offerings tested on visitors included hedgehogs, crocodiles and garden snails. In the 18th century, the house was largely unoccupied and fell into disrepair, but was rescued in the early 19th century by Dean Vincent, who secured the living in 1807 and spent £2,000 of his own money on renovations. The rectory was restored again in 1902, but its upkeep proved a severe strain on the benefice, and it was sold by the Church Commissioners in 1921. During the Second World War, it was used as a sickbay for BBC hostels at Weston and Bletchingdon. More recently, The Old Rectory has been the much-loved family home of the late Charles Skinner, who abandoned a career as a diplomat to work for Oxfam in Latin America and India. After he retired in 1990 due to ill-health, he and his wife, Jane, received many Oxfam visitors at The Old Rectory, holding regular fundraising events in the tithe barn on behalf of the charity. Mr Skinner died in 2005, and Mrs Skinner, finding that The Old Rectory, with its five reception rooms, eight bedrooms, four bathrooms, and an acre of gardens and grounds, is just too much to manage on her own, has decided, reluctantly, to call it a day.